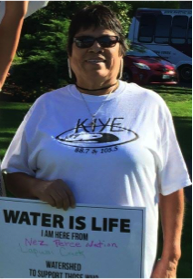 Each spring and fall, Jeannie Strong’s father fished salmon at Celilo Falls on the Columbia River to provide food for his family and community. Nez Perce fishermen from Idaho joined those from other tribes netting fish from platforms suspended above the falls while their families cleaned, smoked and dried the fish to preserve it. They were part of a 9,000 year-old ritual of Native people meeting at Celilo Falls to fish, trade and feast. In 1957, the Corps of Engineers completed The Dalles Dam (12 miles downstream from Celilo Falls) to generate hydropower and to simplify barge navigation on this stretch of the Columbia River. When the Fall’s cliffs were submerged under the dam’s reservoir, native people lost access to sacred sites including Celilo’s village, cemetery and fishing grounds. At the time of the damming, fishers annually caught 2.5 million pounds of fish for subsistence and commercial purposes. 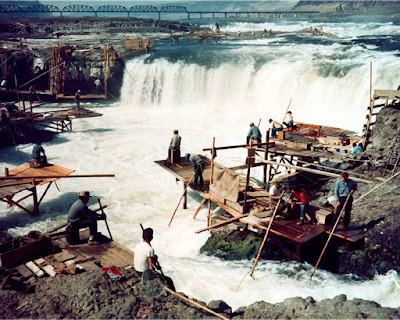 The inundation of Celilo Falls was a devastating cultural loss for Columbia River tribes. The cycle of their lives brought them to Celilo for fellowship and ritual in addition to sustenance. In 2017, many Native fishers live in substandard trailers and families’ homes still haven’t been replaced as promised by the US Government. Resentment over the loss of sacred waters and land still simmers among Native People. Meditation: Do you have home waters to which you return or long to see again? Pause and imagine that you are by your home water. Are you alone or with others? What are you doing? Do you touch the water or cause a splash? Does the sound of the water affect the rhythm of your breath? Are there children to whom you want to introduce these home waters? In the Advent time of preparation, may our memory of the waters of our lives refocus us to see what is sacred and holy in and around us. Amen. Advent is a time to recognize that the world needs Jesus and God’s healing restoration of the world. It is about looking for Jesus’ return as much as it is about the birth of a baby. WHOOHOO!! We are on our way to General Assembly 2018, and we have a strong overture that Fossil Free PCUSA (FFPCUSA) will be supporting this year. The Hudson River Overture (OVT-006) was passed on July 25 and since then four additional presbyteries have concurred. Presbyterians for Earth Care (PEC) and FFPCUSA are in agreement in supporting this overture, and encourage you to bring it to your presbyteries as well. The Hudson River Overture relies on the previous work of FFPCUSA to bring a divestment overture to the General Assembly (GA). It takes into account the recommendations of the committees at the past two GAs, but continues to press for the immediate divestment of those companies on the Carbon Underground 200 list and for the Board of Pensions (BOP) and the Presbyterian Church (USA) Foundation to support the investment in renewables and energy efficiency. The Overture recognizes the steps we as a denomination have already taken to be socially responsible in our investment strategy, and the specific options now available to the BOP and Foundation investors along these guidelines. But it also outlines that it is not enough in the face of increasing threats due to climate change. Harvey, Irma, Jose and Maria devastated communities and reminded us once again that we are falling short on the immediate need to take action to reduce our carbon footprint in the world. As inhabitants of the USA, one of the world’s largest emitters, it is our moral obligation as people of faith to support divestment and the need for a clean energy strategy for the future. Our past decisions on how our denomination uses its funds demonstrates our responsibility to be better stewards of not only our financial resources, but our natural resources as well. By supporting a divestment overture, PEC and FFPCUSA call on the denomination to use our moral authority to end our dependence on fossil fuels and move us into a more sustainable future. 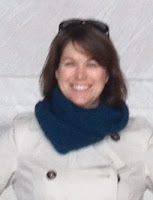 Katie Preston is an M.Div from Columbia Theological Seminary, currently flying the friendly skies with Delta Air Lines. She is a member of the board of Fossil Free PCUSA.